• Dew indicates a good day ahead; a dry morning is sign of showers. • Distant shores loom up "nearer" before rain because of thinning of the air. • Large halo around the moon indicates cirrus cloudform and warm front rain. • A veering wind is sign of fair weather; backing wind means rain. 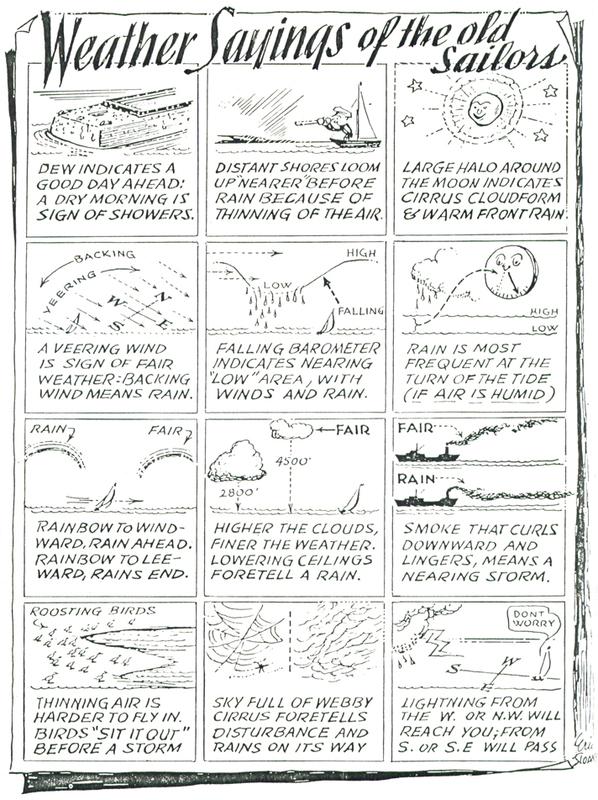 • Falling barometer indicates nearing "low" area, with winds and rain. • Rain is most frequent at the turn of the tide (if air is humid). • Rainbow to windward, rain ahead. Rainbow to leeward, rains end. • Higher the clouds, finer the weather. Lowering ceilings foretell a rain. • Smoke that curls downward and lingers, means a nearing storm. • Thinning air is harder to fly in. Birds "sit it out" before a storm. • Sky full of webby cirrus foretells disturbance and rain's on its way. • Lightning from the west or northwest will reach you; from south or southeast will pass.